The city of Mumbai is never short of surprises. From skyscrapers cluttering the precarious coasts of the Arabian Sea to the forest fringes of Sanjay Gandhi National Park, this city is one of the handful few to harbour great biodiversity sandwiched between a large human population. And just as Mumbai proudly boasts of whales off its coasts and leopards in its forests, it is also peculiarly famous for its purple-winged migrants – flamingos. Not long ago Sewri was just a bleak and drab railway station on Mumbai's harbor-line rail route. With giant oil tanks on one side exhaling the stingiest petrochemical smells, and a fish market on the other side infamous for its strongest organic scents, Sewri railway station is not a place you would want to get down at unless you have a specific purpose. Past the station and westwards is a view reminiscent of steampunk scenes from science-fiction movies: with roads, trees, and everything in-between, smeared with a thick layer of dust and oil. Alongside its pot-holed roads are queues of a hundred trucks, half-full or half-empty with petroleum products. But if you are patient enough to walk past the squalor, you will be blessed by the view of the mouth of Sewri Bay opening into the Arabian Sea, its waters black as night. An amalgamation of various ingredients makes this coastline interesting to look at. Leave aside the giant dysfunctional oil tankers that have been marooned for decades along the Sewri harbour, the most common ingredient of this black soup are tyres – hundreds of them, mixed with plastic, glass, broken furniture, and remnants of idols. And if you look closely, you might spot a few hardy mudskippers, fiddler-crabs, mollusks, and birds scraping out a living from the junk. A few decades ago (speculated to be from the 1970s to the early 90s) someone noticed pink-coloured birds in these dark, uninviting waters. Slowly, birdwatchers started flocking to this lesser-known place, and today it has became a pilgrimage site for birdwatchers of Mumbai and neighbouring cities between the months of December and May. It took several years for the general public to realise that our city is being visited by these rather exotic birds. Who would have thought that a bird such as the flamingo, that seems other-worldly, would visit Sewri of all the places? And before we knew it, Sewri was transformed into a tourism hotspot, and people now spend their time here learning and earning by watching these birds. 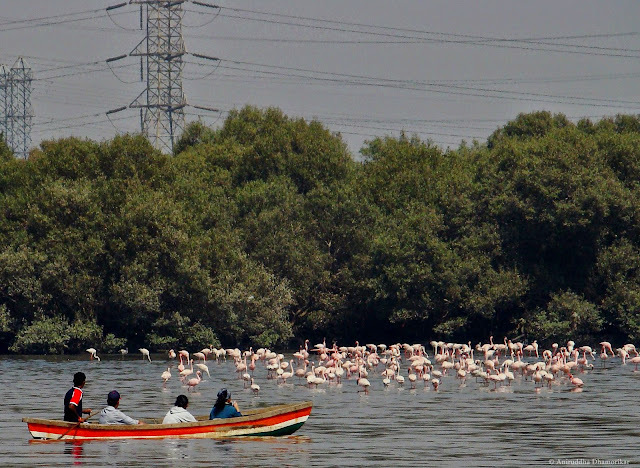 Tourism picked pace in Sewri, however boating so close to flamingos was later banned. Although thousands of people gather here every year, nobody really knows how, or why, these birds favour this spot. Were they driven away from their original feeding grounds, or were they an example of pioneering explorers, the Scott and Amundsen of India? Or did they just appear out of thin air? Nature follows an algorithm, controlled by many factors. Everything happens for a rational reason. Every new organism in its habitat is an indicator of something. Something might have attracted them. I searched around a little to answer the how and the why, but it seemed as though nobody has concrete reasons for their yearly visits to Mumbai. A friend of mine, who is an ornithologist, told me that these birds feed voraciously on Cyanobacteria, called blue-green algae, and the algae is the reason behind their pink plumage. Flamingos are also known to eat small organisms such as diatoms found in the mud. Let’s assume that food is why these birds are here, perhaps because their earlier feeding grounds were destroyed. The food these birds eat is microscopic, and thus they are required to eat a lot of it to maintain their body weight. Their presence in Sewri perhaps implies that there is a large quantity of algae and microscopic organisms, and a large quantity of algae generally indicates heavy organic pollution. Algae are highly opportunistic, and require the least amount of basic nutrients to thrive: nitrogen, phosphorous, and certain levels of oxygen and carbon dioxide. Algae grow very quickly in nutrient-rich environments, consuming all the nutrients that are available (they grow especially well in highly organic sewage), and then die off. This eutrophication process is then taken forward by other microbes which consume the dead algae, and use up all the little remaining oxygen in the water, which results in hypoxia and can kill all organisms in the vicinity. Such oxygen-deficient zones are called dead zones. What’s happening in Sewri is probably not as extreme, or else the stench would be far worse than the petrochemical smells that literally sting your nose, but the situation is rather grim. I came across a study titled “Characteristics of Sewri-Mahul IBA, an important Flamingo habitat along Thane Creek” by O.R. Arun Kumar. The study reports high levels of heavy metals like lead and copper in the mud and water samples he collected from Sewri. These heavy metals, due to their easy mobility in aqueous ecosystems, are toxic to all organisms at certain levels. Their concentration goes on multiplying as they move along the food chain, magnifying their toxicity from microscopic algae to a large animal such as a flamingo that feeds on microbes. Studies have shown that absorption of higher quantities of heavy metals can cause cancer, mutations, and genetic damage. 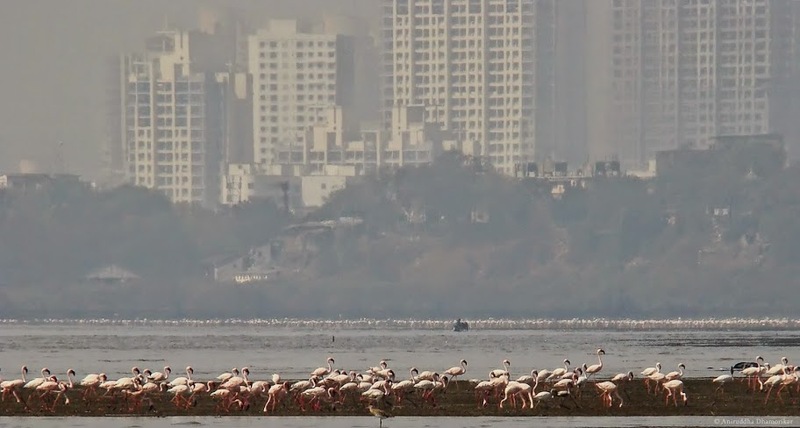 If Sewri is heavily polluted, the flamingos of Mumbai are consuming a large quantity of toxins, and if these birds are breeding with other healthy populations, the possibilities of deformities in future generations substantially increase. Sewri’s problems do not end here. The proposed Nhava Sheva-Sewri trans-harbour link is considered as a great threat to this fragile flamingo habitat, and several conservationists are against it. According to media reports (Mumbai Mirror, July 2014), the Forest Department of Maharashtra is about to declare 1,500 hectares as a Protected Area, assigning another route for the Nhava Sheva-Sewri trans-harbour link. Conservationists believe that this move will be crucial for the conservation of flamingos. Although this is welcoming news after the long debate about Sewri’s fate – which could have ended up like that of Uran – there are some basic facts which might have been overlooked. While we are declaring 1,500 hectares of an area as a Protected Area (PA) we are ignoring a very fundamental fact. When it comes to aquatic ecosystems, we cannot treat a piece of an aquatic ecosystem with a special status, we have to consider the entire watershed or at least a micro-part of it. As far as I know, PAs should aim to protect the entire ecosystem and food-web, which we also form a part of. Declaring a small stretch of the creek as a PA will not help in the conservation of the ecosystem or even that of flamingos in the long run if there are heavy metals in the water polluted from effluents released upstream in areas which do not fall inside the PA. Efforts should therefore be made to reduce the pollution of the entire watershed – Thane Creek in this context. The steps taken towards conservation of flamingo habitat in Sewri are far from picture-perfect, and we mustn’t look at the future of these pink birds and their wintering grounds through rose-tinted glasses. It is crucial to look at this PA not only as a site for flamingos, but also for the plethora of life-forms that flourish here, and definitive steps should be taken to curb pollution. If all things fall in place, Sewri will be the perfect example of how crowded cities like Mumbai, with all its people and all its industries, protected a wetland and its denizens for its intrinsic ecological value. Talks of Sewri being declared a full-fledged Protected Area/ Sanctuary (Downtoearth, December 2011)/ Ramsar Site (Hindustan Times, February 2013), have been in the news since 2011, with recent reports from July 2014. Some of the rules and regulations governing wetlands in India were drafted by the then Ministry of Environment and Forests in 2010, which are worth looking at while thinking of Sewri. Ø It calls for the constitution of a Central Wetland Regulatory Authority, Chaired by the Secretary, MoEF and, as expected, members from various Government ministries like Agriculture, Water Resources, Tourism, Social Justice, Central Pollution Control Board as well as four experts from the fields of hydrology, limnology, ornithology and ecology. Some of these experts nominated by the government for a three-year tenure through a no- transparent process, do not seem reliable. Ø It seeks to regulate wetlands which include Ramsar Wetlands, and what it calls ‘Protected Wetlands’ which include ecologically sensitive wetlands, wetlands in protected areas, UNESCO sites or wetlands near UNESCO sites, wetlands above the elevation of 2500 meters with an area larger than five hectraes or, wetlands or wetland complexes below the elevation of 2500 meters, but with an area larger than 500 hectares or any other wetlands suggested by the Central Wetland Regulatory Authority. Ø Restrictions on activities within wetlands include reclamation, setting up industries in the vicinity, solid waste dumping, manufacture or storage of hazardous substances, discharge of untreated effluents, any permanent construction, amongst several others. Ø Regulated Activities (which will not be permitted without the consent of the state government) include hydraulic alterations, unsustainable grazing, harvesting of resources, releasing treated effluents, aquaculture, agriculture, dreading, etc. Ø The major functions of the authority include identification of new wetlands for conservation, ensuring that the Rules are followed by local bodies, issue clearances, and others. Ø The State Governments are to submit a ‘Brief Document’ about the wetlands in their state which qualify for protection under the Rules. The Authority will then assess the wetland and if accepted, the Central Government shall notify it as a ‘Protected Wetland’. Ø Any appeals against the decision of the Authority can be made to the National Green Tribunal. O. R. Arun Kumar. 2013. Characteristics of Sewari-Mahul IBA: an important flamingo habitat along Thane Creek, Mumbai, India. MFSc. Thesis. Central Institute of Fisheries Education. Van Dolah, Frances M. 2000. Marine algal toxins: origins, health effects, and their increased occurrence. Environmental health perspectives. 108 (1): 133. Ali, Salim. 1979. The book of Indian birds. Bombay Natural History Society. Vishal is a Research Fellow at the Central Institute of Fisheries Education (CIFE), investigating the natural and artificial radioisotopes in aquatic ecosystems of Chutaka in Madhya Pradesh. He is currently pursuing his PhD by investigating the ecological services of urban wetlands for the well-being of a city. This work is © Vishal Rasal and has been published with his permission. All the views expressed in this article are that of the author. No part of this article can be used without prior permission of the author. Please visit the author’s website for more information. Very well written! Thanks for highlighting this unique aspect of Mumbai's biodiversity and the problems that it is facing.